More like crap-tastic, amirite? This update pays respect to the release of the new Captain America: First Avenger movie by hitting you with content based on characters from Cap’s comic along with Data East’s “Captain America and the Avengers” arcade game. Non-comic book fans won’t be left out thanks to a classic beat-em-up bad guy crashing the party since this is also the 11th Anniversary week of ScrollBoss. Gotta have some gaming stuff in there somewhere! Marvel – Batroc the Leaper, the Falcon, Namor, the Red Skull, Ultron, the Wasp, Other Heroes (Ant-Man and Diamondback) and “Other Villains” (Absorbing Man, the Controller, Crossbones, the Grim Reaper, Klaw, the Living Laser and Whirlwind). Marvel – Diamondback (scratch-made), the Falcon, the Grim Reaper, Namor, the Red Skull, the Vision, the Wasp (scratch-made) and Whirlwind. An Iron Man taunt has been edited into the armor he wore in CAatA. 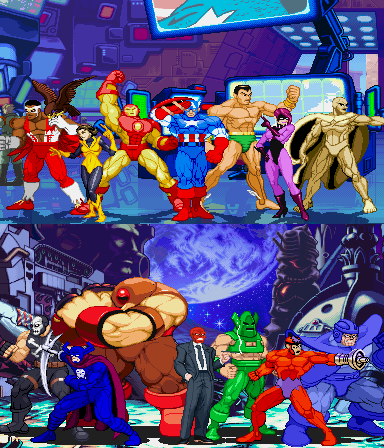 Captain America and the Avengers gallery rebuilt in the current style and has new sprites. Mini Logos: Sakura added to Capcom. Batroc, the Red Skull added to Marvel. Jem added to Toys and Cartoons. The Announcement: ScrollBoss is on hiatus until further notice. There won’t be another update for a while and updates won’t be regular when they start up again. I have some important projects that require a lot of time so I’ll have to put this site on pause for a while. The main thing is that it’s time for me to hit the drawing page again. One of the main reasons that I kept working to make sure that the GFX Generators were loaded with options was because I wanted you to keep having fun as the site was inactive. ScrollBoss will NOT be neglected. I have some coding improvements in mind and it’s nearly impossible to do them while also trying to get enough content for a site update. I can work on those things on the side until the time comes to un-pause ScrollBoss again. I also have some bigger things pixel-related things that I could never do because I had to keep doing smaller things to make sure I had an update. There will be previews of these things on the weblog and main menu. I’m still taking sprite and pixel art commissions (because it costs money to have this site hosted), posting ridiculous screenshots on the Tumblr and you may see some new scratch-made sprites appear on Illmosis. ScrollBoss will be active again before the end of the year and it’s going to hit hard. Until then, please leave any feedback in the comment section of this topic. Thank you for reading and thanks for stopping in. Here comes some new and old challengers! GFX Generators – Slight improvements were made to the engine but the only one you’ll notice is that the transparent shadows no longer overlap and make darker areas. New characters: Adon, Birdie, Dee Jay, Fei Long, Gen, Karin, R. Mika, Rose, Sakura, Shadaloo Dolls and T.Hawk from Capcom’s Street Fighter. Marian, Abobo & Burnov from Technos’ Double Dragon games (Neo Geo fighter sprites). 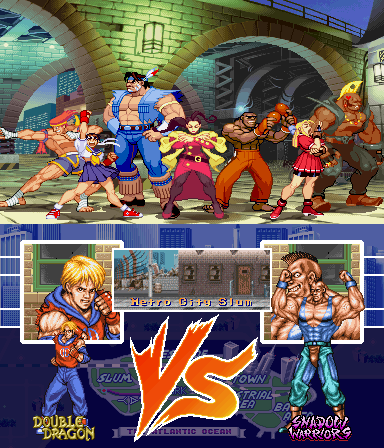 VS. Mode “Custom Scene” backgrounds: Italy from Street Fighter Alpha 2, Code Red and On The Hilltop from X-Men vs. Street Fighter. Game Index – Captain America and the Avengers added. The next update update will be in about two weeks from now. That puts it close to the 11th Anniversary. It won’t be anywhere near as big as the 10th Anniversary but there will be medium-large announcement about why it will be the last ScrollBoss update for a while. Another reminder: the ScrollBoss Tumblr, Scroll like a Boss, exists, is active and has more than update post links. I’ve been posting screenshots that make me smile for all sorts of right and wrong reasons along with videos and reposts of cool game-related stuff I like there.